For further details on all these events (NoR and Entries) refer to the 2019 Open Events tab on the website. We look forward to seeing your entry soon. The Marblehead Nationals were sailed at Manor Park last weekend, and once again were won by Brad Gibson. Andrea Roberts also had an excellent performance and finished 4th overall in a highly competitive fleet. 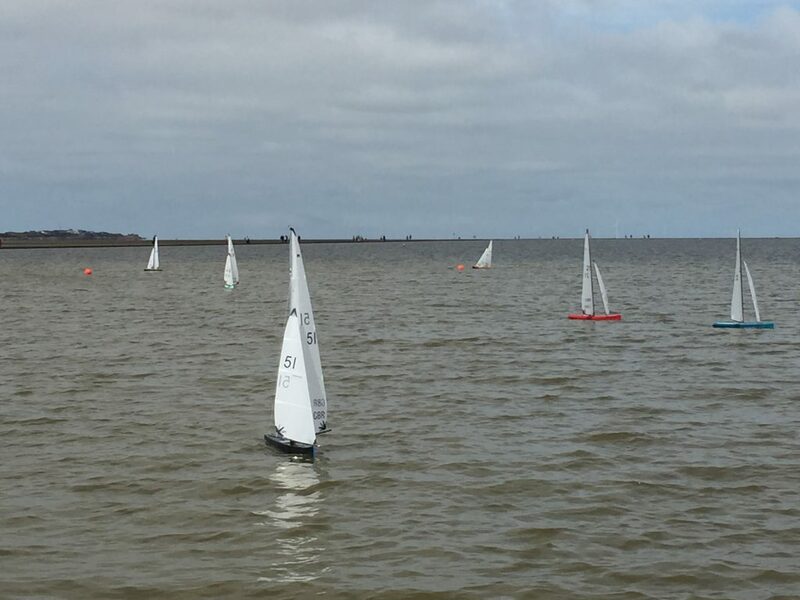 Unfortunately, this Saturday’s planned Marblehead racing at West Kirby has had to be postponed. Details of any re-arranged racing will be posted here when they are confirmed. Fantastic sailing conditions welcomed the 7 skippers to West Kirby, sunny and the wind blowing out of the North West, simply lovely. All skippers opted for the ‘B’ rigs to start with, a long first beat to the windward mark then over to a spreader mark before a long run down to the gate, twice round and finish. John Tushingham sailing a new design from the pencil of Alex Corey was the early pace setter winning 6 out of the 9 before lunch. A few skippers opted for there ‘A’ rigs after lunch as the wind dropped slightly. Graham Elliott had better luck after lunch winning 5 out of 7. Colin Walton and Bill Culshaw (14,000steps) both had some decent races with Bill getting the win in race 8 and kept the pressure on John and Graham all the way. Mike Parkington and Neil Westbrook also showed promise after both suffering some niggly problems. Unfortunately Dave Potter had to go for an early bath after suffering from a battery eating TX. Big thanks must go to John Brierley and Dave Williams for the course trimming, scoring, starting, getting the marks to and from the lake, launching and landing the rib, it does not go un-noticed or un-appreciated. A reminder to all that the M class will be sailing at West Kirby lake this coming Saturday and not at Gautby Road. Entry is open to non-club members. Graham Elliott has requested that anyone planning on attending (club member or not) please contact him (elliottyachts@hotmail.co.uk) so that he has an idea of the number of people turning up. Due to the lack of entries for this Saturdays Marblehead racing at West Kirby Lake (30th June) the decision has been taken to cancel the event.